Colorblocking. Every fashion magazine and fashion lover has been both talking about and sporting this trend for the last few months. Funny thing is, we have all done it with many of our outfits before, yet right now the focus is on extreme lines and colors paired together in an eye-catching way. Many designers in the handbag world have taken a stab and many have failed (remember the Chloe mess we shared earlier this week?). 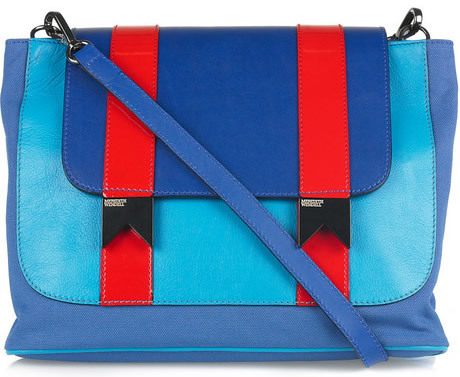 If you are looking for a handbag designer to turn to for the perfectly colorblocked bag, Meredith Wendell is your girl. I’ve had this bag saved in my tabs list for over a month now meaning to share it with you. I adore the school boy coloring and design of the Meredith Wendell Bucket Leather and Canvas Shoulder Bag. In fact, when I first saw this bag I felt a pang of nostalgia. While growing up, I had a watch that featured the exact same color family. That watch was my pride and joy, I wore it everywhere and was certain it was THE.COOLEST.WATCH. anyone in my school possessed. Part of my love comes from that and part comes from the sheer awesomeness of this bag. How often have you seen colors this bright and vivid paired together in a handbag? And if you have seen them, I bet that more likely than not, they looked like a hot mess. But not on Meredith Wendell’s creation. On her bag, the colors are beautiful, playful and utterly chic. On top of it all, the triple-pocket interior structure is totally functional. This indigo, blue and red pairing is exclusive to Net-A-Porter for $795.